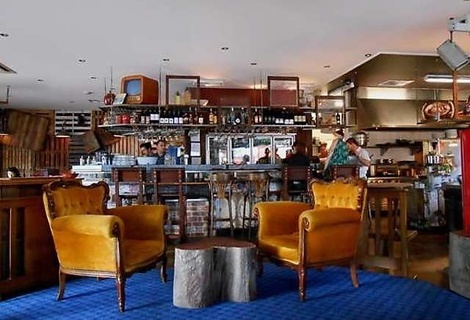 Small bar with big attitude - Outstanding food and great atmosphere. 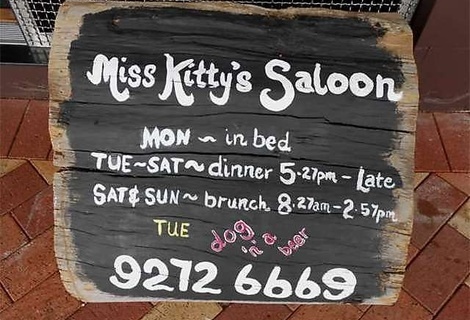 Miss Kitty's Saloon was reviewed on Tuesday 2nd April 2013 18:21 by Richard. It still amazes me that there are hardly any places in Perth you’re able to get good quality real authentic American / Canadian food from. Thankfully the newly opened Miss Kitty’s Saloon, on the corner of Beaufort St and 9th Ave in Inglewood, is here to rectify the situation For the record I’m talking about the good kind of American food, barbecued slow-cooked meats, hot wings, chilli, hot dogs etc, not the dirty liquid cheese on nachos kind. While they might not serve the food in the traditional “supersize / size of your head” type style that’s now almost synonymous with American cuisine, Miss Kitty’s does a damn good job at putting together their interpretation of the food and flavours of America / Canada in a range of different tapas style portions. 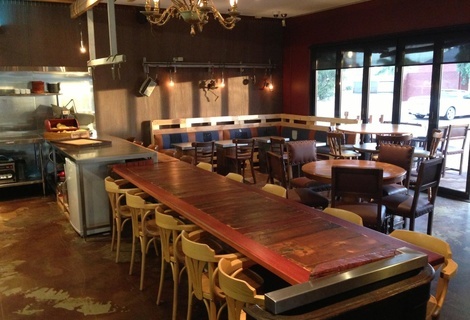 We booked in with a few friends for an early dinner and some mid-week stress-relieving beers. I never realised that Inglewood was quite so far from the city, however, the great thing about being located so far up Beaufort Street is that there’s plenty of parking and the roads are far less busy than Mount Lawley’s to the South. The interior looks amazing, the owners have obviously gone to great lengths to give the bar a cosy feel to it and everything from the funky decor (peanut dispensing machines, old school lounge setting and rustic chandeliers) to the western style ‘cowboy and indian’ music they were playing added to the incredible atmosphere of the joint. We were greeted by a friendly and genuinely enthusiastic waitress as we walked in and once shown to our table someone bought over a bowl of complimentary peanuts from one of the machines to get us started. We just about ordered everything on the menu to share between the four of us - remember most of these were tapas style serving sizes. We got; the fried pickles, steamed buttermilk bun, charcoal tamarind pork ribs, corn fritters, hot wing pancakes, BBQ chicken, wood charred beef and poutine. Ok maybe this does sound excessive, but it was probably just the right amount of food for two couples (especially when you factor in dessert – we got both the pecan butter tart and the banoffee pie). The menu has a great range of meat and non-meat dishes and whilst it’s probably not the healthiest sounding menu it’s definitely a contender for the tastiest. Drinks wise the story is not quite the same, with only a few beer and cider options (one on tap) and a fairly small wine and cocktail list. I had a few tap beers, Feral Hop Hog - a delicious locally brewed IPA with plenty of hoppy goodness and my mate had the St. Ambroise oatmeal stout – one of the smoothest stouts I’ve ever had. Our food came out intermittently within 20 minutes of ordering, done on purpose, as there wouldn’t be enough space on the table if it all came out at once. Every single dish was great, I honestly couldn’t fault one thing. Highlights for me were the hot wing pancakes (love the buffalo sauce) and the wood charred beef – perfectly medium with a great smokey taste to the beef but my clear favourite had to be the poutine, if you’re unfamiliar with poutine, it’s a Canadian staple – chips (fries) in a bowl of rich brown gravy topped off with cheese curds. 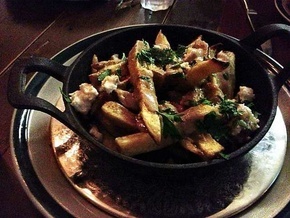 If you’re currently compiling a bucket list, or anything of the sort, do yourself a favour and add “eat poutine” to it. If you’re not planning on travelling to Canada anytime in the foreseeable future, go to Miss Kitty’s. Their poutine was the absolute ducks nuts, I even ordered a second serve while we were waiting for our desserts – which were also great. To be honest I hadn’t done too much research before going to Miss Kittys’ and was expecting huge portions and dirt cheap prices (like you’d find in the states). Turned out it was quite the opposite, small tapas style servings with moderately high prices. However, considering the outstanding quality of the food (and the fact that you can experience a little bit of everything) the prices were more than justified. It ended up being just under $50 a head (including drinks) which is not bad at all considering the great food, excellent atmosphere and friendly service. I can’t recommend Miss Kitty’s Saloon highly enough, definitely worth a visit if you’re in the area or even if you aren’t.